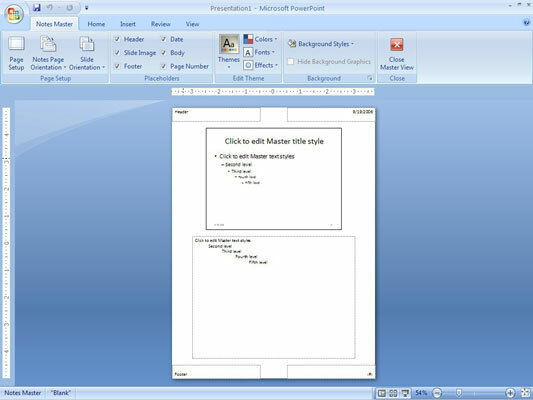 PowerPoint lets you create notes pages with a reduced image of your PowerPoint slide, and any notes that go along with the slide. When printed, notes pages are formatted according to the Notes Master. Be sure you add page numbers to your speaker notes. That way, if you drop a stack of notes pages, you can use the page numbers to quickly sort them back into order. The Notes Master contains two main placeholders: one for your notes text and the other for the slide. You can move or change the size of either of these objects, and you can change the format of the text in the notes placeholder. You also can add or change elements that you want to appear on each handout page. Also notice the convenient placement of the header, footer, date, and page number blocks. 2Click Close Notes Master tab. This way, you can see whether your changes worked.